Devil’s Dyke, a 100m deep valley in the South Downs, near Brighton. Legend has it that the Devil was digging a trench to allow the sea to flood all the churches in the Sussex Weald. His digging disturbed an old woman who lit a candle, or angered a rooster causing it to crow, and made the Devil think that morning had arrived. He fled, leaving the unfinished trench. The last shovel of earth chucked over his shoulder fell into the sea to form the Isle of Wight. Published on the Kindle (April 10). It was a ‘dog’s life’, he was told, in the sailing ships that killed on average one man every voyage. And 'Greeny' soon discovered that you had to eat hard tack teeming with live maggots and weevils, or starve. 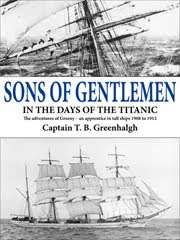 Then came the biting cold, scorching heat, gales, doldrums, wild seas, brutish officers (including the captain), a cloud of lethal vapour that enveloped the ship… and appalling deaths. The crew, ignoring superstitions, even slaughtered a majestic albatross for fun. Yet, floating above all the hardship was the beauty and romance of sail, which enslaved a teenage dreamer for ever. © 2010 UKpix.com -. Awesome Inc. theme. Theme images by wibs24. Powered by Blogger.